The Rickshaw looks so small? Or he is that big? 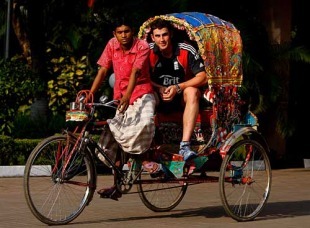 "Craig Kieswetter"
this just shows how small us bangladeshis are by nature. Four of us (except selected few, they needed a rickshaw by themselves, motu group) use to ride these rickshaws all the time. can anyone shed some info on him please. I swear bhais, this rickshaw looks like imported from Noakhali, Feni, Lemua, DagunBhuiyan, Porshuram area (no offence to these areas, these are my roots too)! That's my nanar bari area, Rickshaws passengers' cabs/hoods are short in that region, for short people......but my dada's side, from Brahmanbaria, Comilla, Akhaura Rickshaws' hood/cabs are at least 2 feet taller as we are naturally taller people! We should have put the Englishman in a Brahmanbarian rickshaw! haha bechara re sesh pojonto airport theke rikhshwa diya sheraton e jaite hoilo. Luggage, pant shob churi gasey!!! He is smiling because "gengi ar hap pant" nitey parey nai. Kono beta manush ki hud tuila rickshaw'tey uthey? uthaiteo pare, since his skin colour is white. Billah bhai'rey bash dao kaan? The Risksha wala should take him to pothole ridden kacha Rashta with hood on....for the next two weeks he will be walking like a person with hemaroid problem. is that nannu in the rickshaw? CAPTION: Keiswetter becoming familiar with his new home, since England refused to pay for his ticket home, after the thumping defeat from BD. Are you from feni or dAgonbhuiya? O Susannah gechos kina bhuila amarey. Ami ekhon rickshaw chori Dhaka shohorey. Ji mama, salaam! Amar amma is from Lemuabari, Feni! Dhakar gorbo the rickshaw made it to the cricinfo front-page. Par-tay! did anyone try and calc the ratio between the two heads? Rickshawal's head is exactly half the Kieswetter's head. Btw.. Who is pulling the rickshaw, its not Lotus Kamal is it? i have all the free time in the world, but why the f&** will i try and do and that?